English version of “Snowdens uppgifter tar en helt ny väg“. Published today, 22 Jan 2014 in SvD. Glenn Greenwald, the American journalist and political commentator who – through files leaked by whistleblower Edward Snowden – revealed to the world the widespread American surveillance, opted in October 2013 to leave the British newspaper The Guardian, to work instead with the eBay billionaire Pierre Omidyar. Together, they will develop First Look Media, a new digital-journalism project which Omidyar finances with an initial capital of 250 million dollars. This means that Omidyar, to operate in a larger political-economic agenda, has hired one of the most government-criticizer journalists that exist, and eventually he is establishing an indirect collaboration with the world’s most hunted whistleblower. During the same month that Greenwald left his post at The Guardian, 14 activists associated with the political free-speech movement Anonymous were subject of court trial in America. The protesters, also called hacker-activists because of their use of computer-related technologies for political purposes, were accused of intentionally injuring the international payment site Paypal’s internet traffic during December 2010. The political reason behind this digital protest was that Paypal together with other payment companies such as Visa and MasterCard, had withdrawn financial services linked to WikiLeaks editor Julian Assange, at the request of the U.S. government. This is because Wikileaks – the non-profit media organization that reports and publishes classified information to the public – including the publishing of the classified materials provided by Chelsea Manning (formerly known as Bradley Manning ). The blockade meant that WikiLeaks could no any longer receive the donations that enabled its existence. When Paypal blocked the financial transfers to WikiLeaks, the 14 protesters replied by sending thousands of micro files ( DDoS ) to Paypal during two hours, in order to overwhelm the site’s computer systems. On Thursday, December 5th, the majority of the accused acknowledged the charges (“conspiracy ” and “deliberate damage to a protected computer” ) as part of a legal agreement which meant $ 5,600 in fines for each – in exchange for that prison sentences would not be imposed at the final judgment that is scheduled for 2014. During the impeachment process against the 14 hacker-activists, Paypal has been collaborating with the U.S. Department of Justice prosecutors. Paypal is a subsidiary of the multinational e -commerce company Ebay (who also bought the Swedish eBay ), where Pierre Omidyar is both founder and chairman , and has substantial financial interests. When Omidyar now hired Glenn Greenwald and other American journalists to work in the new journalistic project, it means that Greenwald goes into business with the president of the company that blocked online financial donations to WikiLeaks. The operation against Paypal thus arose as support for Wikileaks, and the 14 hacker activists associated with Anonymous are indeed now in a legal battle against PayPal. This occurs while Omidyar is funding a new media company with a quart of one billion U.S. dollars, and where the reporters not only support the right to ” free speech” but also use WikiLeaks as a source for their sensational news. This paradox does not necessarily mean that Greenwald no longer defends Wikileaks or Anonymous’ political struggle for freedom of expression, state/corporative transparency or the civil right to anonymity. But neither it is a coincidence that Greenwald’s involvement with Snowden’s eventual future documents, can now indirectly be redirected and contextualized in a larger political-economic agenda. So, who is this Pierre Omidyar ? According to The Independent newspaper he was born in 1967 in France to Iranian parents after fleeing the Shah’s regime in Iran. Forbes magazine writes how Omidyar moved to Washington at age six, and today he is USA’s 47th and World’s 123rd richest man. He is also a noted philanthropist who donates huge sums to foundations, in his ” vision for positive change driven by the individual ” (as the Omidyar group writes on its website). It is from this (philanthropic) platform that Omidyar explains that he intends to support independent journalists in full, all in support of public interest. And he wants to find a way to convert regular readers into concerned citizens. Omidyar has previously said that his business is based on the idea of acting as a “force for good “, and the interest for critical investigative journalism (a journalistic form which according to him does not give much money) follows the same track. However, critical grassroots’ voices argue that it would be naive to think that one of the world ‘s richest people voluntarily commits himself to finance journalists who question and challenge the political and economic structure that allows Omidyars own economic power to expand. The logic is simple: if you hire a U.S. critic (Greenwald) and give him several million dollars to implement specific projects with a clear U.S.-critical focus, the following question arises: Why choose to be at odds with the U.S. government? 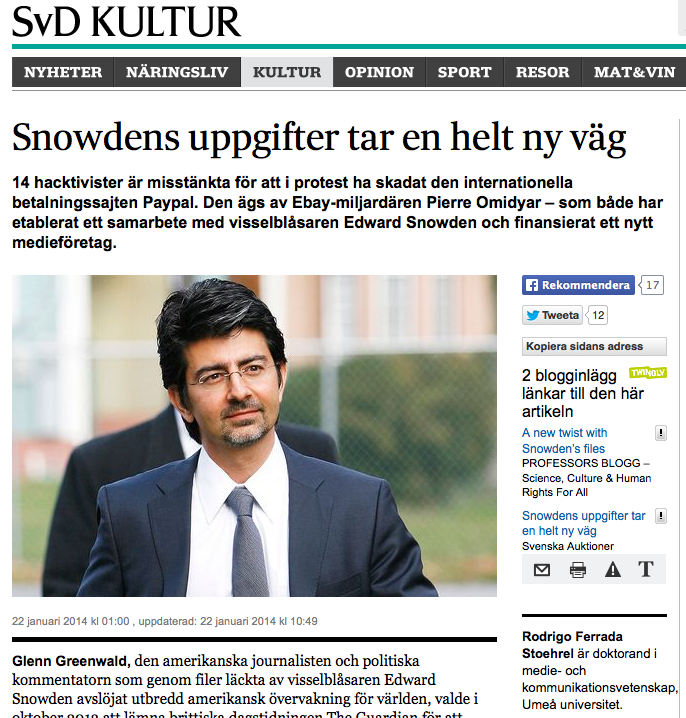 And if Omidyar becomes “enemy ” of the U.S. government – who will be his “friend” ? Additional voices argue that the merger Greenwald/Omidyar is more about an attempt in advocating against the state apparatus that controls “too much” both the market and individuals. In short, where the government-critical information contextualizes in relation to certain political and market ideas based on individual and economic freedom – without strong government regulation. Hence the leaked critical information is not targeting state apparatuses or authorities as such; instead it functions towards an influencing effect in the long run: for a mobilization against the mentality that accepts a bureaucratic state that routinely control its citizens/companies through a variety of means and techniques. What is thus latent under progress is something more than the concrete information coming out through Snowden and Greenwald . The interesting thing is (also ) how these activists and journalists’ knowledge is indirectly influenced by political and financial power . The Guardian’s editor says (3/12) that they have “published just one per cent of all Snowden’s documents”; which means that a substantial amount of information remains to be published – information that it will likely be distributed by First Look Media. That is, coming Snowden leaks are will no be published in a vacuum but instead under strategic management, published at a particular political time-occasion, and adjusted to other news articles. If there are only 1 per cent of all Snowden leaks that have been published by The Guardian, it is now First Look Media that will have a unique opportunity to decide when, where and how sensitive data would be fit to be published. To summarize: the information war is structured and controlled in an increasingly organized, populist and at an establishment level. The actors are no any longer solely Snowden or Greenwald, neither is what they say the only thing what matters; but also how they say it and in what context; who/what could indirectly influence these government critics; and who/whom is profiting or losing with a certain type of information that comes out to the public. Seen from this perspective, Snowden and Greenwald works as pawns in a power game competing to win the public’s political preferences, where the control by the Government of critical reports become “business as usual”, a market for further political and economic ends. None of this undermines the seriousness of Manning’s or Snowden’s leaks, on the contrary, the question is rather how the political-economic management of these leaks and their spokespersons will be developed: which outcomes shall crystallize and how they promote or discourage different market and political forces. Meanwhile, and in the margin, parts of the Anonymous movement are still awaiting court verdicts; individuals and formations of young hacker activists who risk long prison sentences and substantial fines for political activities associated with the free speech . Their struggle is also completely outside financial interests. Not like that sweater for sale on eBay Tradera.